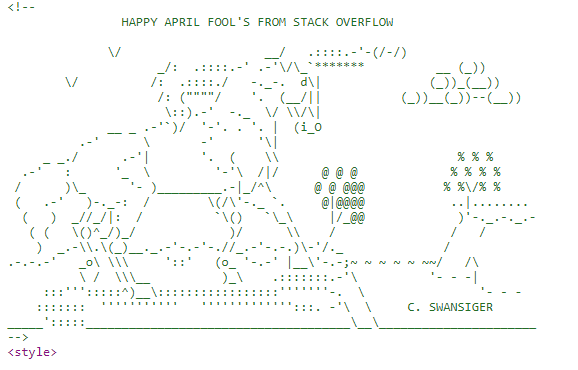 Over the years, users have told us that Stack Overflow is an indispensable tool for coders all around the world. Programmers know that when they get a Stack Overflow search result, it's likely the search is over. Following that link almost always gets a step closer to understanding whatever programming problem they face. Failing that, they can ask some of the world's most helpful and skilled developers directly. It’s hard to imagine what it was like to write code before Stack Overflow was created just over a decade ago in 2008. 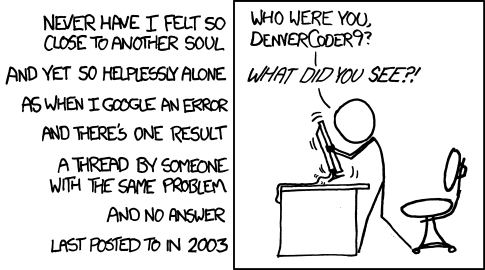 In those days programmers used a variety of incantations such as AltaVista, WebCrawler, ICQ, Gopher, IRC, LISTSERV, Usenet, man and even O'Reilly to summon answers. How many times did I come to work early in order to borrow a copy of UNIX in a Nutshell from a possessive co-worker? (Yes, Jim, I knew you didn't have those shell commands memorized. I saw you furtively flipping through that book when you didn't think anyone was watching.) Oh how I revelled when I drove home from the university bookstore with the student edition of Borland C++ and its glorious manuals! Now I had the knowledge! Helping people wasn't paradise back then either. Answer once in one forum only to see the same question in another a little later. (Probably from the same asker since you could never be sure where the best place to ask was.) Compiling a FAQ might have helped people, but nobody says "I loved the FAQ! It solved my problem." Instead, they are all like "I read the FAQ, but it didn't help." Or they don't read the FAQ and just ask their frequently asked question. Nobody upvoted the FAQ. It seems a shame that it took two decades from the invention of the Web before a fully-featured, public Q&A engine was built. Just think of all the time (and trees) we could all have saved by having easy access to canonical library of answers. In an effort to (retroactively) make the world a better place, we're cutting that dark time in half. 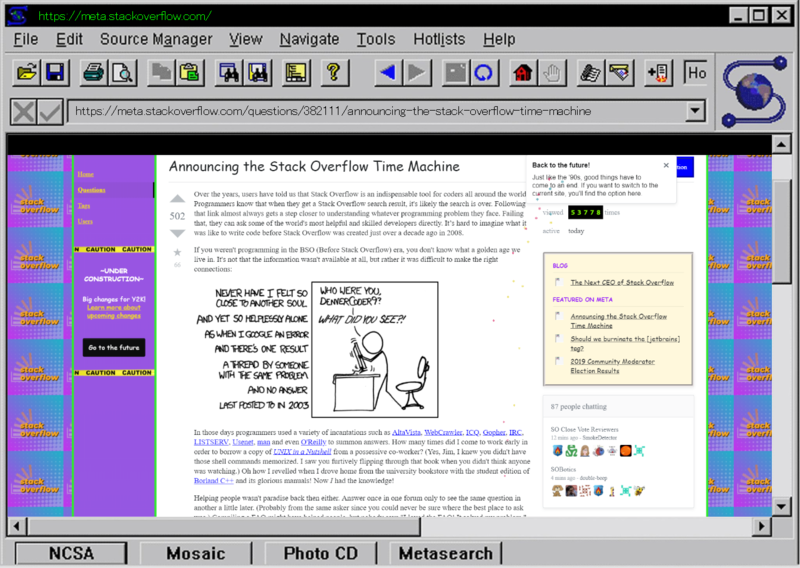 We’re proud to announce a new Time Machine feature that lets you experience Stack Overflow when it should have been around: not 2008, but 1998. 1.7 MB image? Are you kidding me??!!!!!!!!! Also, how does the date say 1919? Is that a glitch? This page took half an hour to download although I have a fast 14.4kbps modem connection. I don't know how they did it, but this looks fine both on 1024x768 and 800x600! And without using a single table! I think you should follow current design trends and use the amazing <blink> tag more often. Other than that the design is great, in particular the glossy gradient text that looks so much realistic thanks to the backdrop shadow. 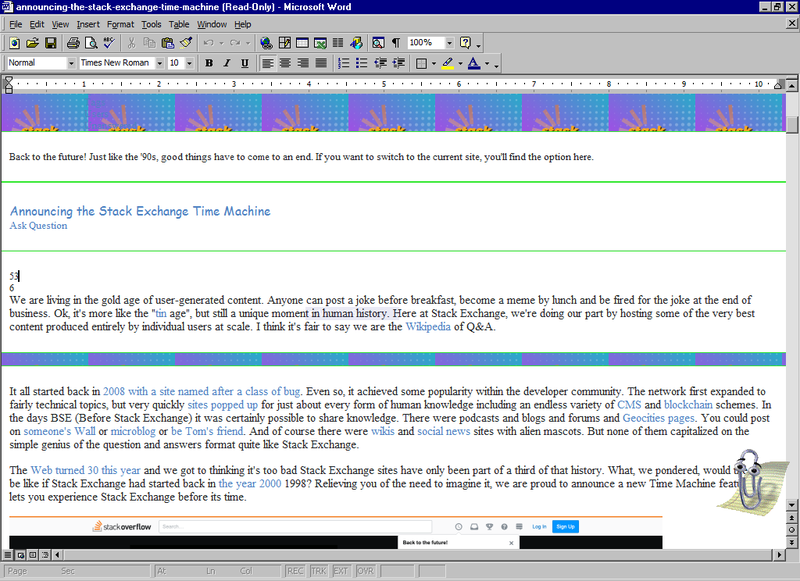 PS: Comic Sans MS adds a sweet human touch to the overall reading experience. Thank you for taking into account timezones! As an Australian, I was pleasantly surprised to wake up this morning to this masterpiece of web design without having to suffer the agony of waiting for the Earth to rotate to such a point that our local star had line of sight to the landmass commonly known as the continental United States of America, as so often happens. Just installed Windows 98 but not able to launch 3D pinball. Am I the only one who wishes the site was always like this? Is there anyway I can keep this after Apr 1 is over? I hope you will tell us tomorrow if more questions were downvoted than usual. Help . 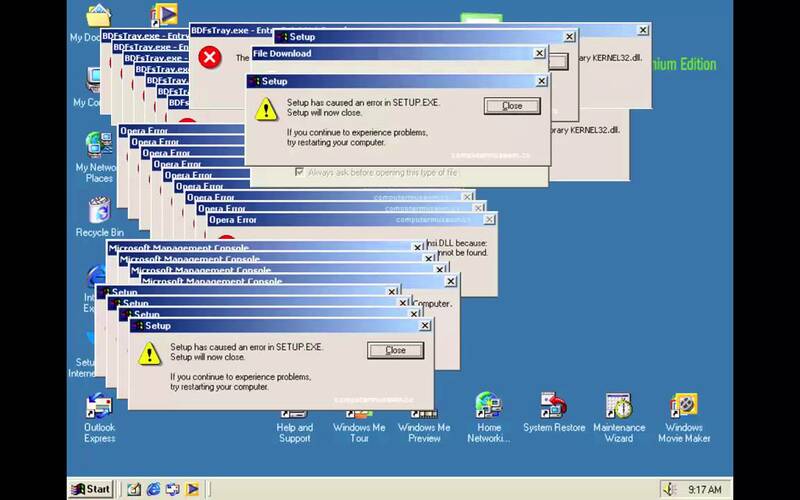 I have been playing on my parents' Windows 95 computer and I am getting errors now . Can you help me ??????????????????????????????? What I have found in page source. Guyz I just bought this personal computing machine, can we also add a feature for <<< BACKGROUND MUSIC >>> for this forum? also I have a few family pics that I wanted to show you folks, can anyone please upload the drivers for apple flatbed scanner? Thanks for your help. This reminded me of some pages by Henning Thielemann I read back in 2001 when I was 19. They forgot to add a few random BS e-mail addresses generated with markov-chains to feed the spam-miners. how do run macro i recorded need progremer help please!!!! Please fix the scrolling text, it is not created by using marquee tag. How do I get rid of the padding in a table? My logo and navigation have a weird space between them. I've searched and searched but all I get is f*$%ing Experts Exchange links. Those colored snowflakes lag on my Netscape communicator (I'm a Voodoo 3 user). The page freezes before the animation ends. Now I have to use the keyboard only to avoid mouse move. I am interested to know how do they have the asterisk sprinkle when the cursor is moved. But looks good, it does look like some goofy '90s over painted place, but the font's look good :-) and colorful. I'm just trying to figure out how you guys created this entire page without using a single <FONT> tag. This question could have really helped me in 1987. I would ask you to rewind the time machine another decade, but that would put us before the creation of the Web itself, and God only knows what sort of anti-causal horror that might bring about. Please help. I am using DSL and the webpage isn't running. 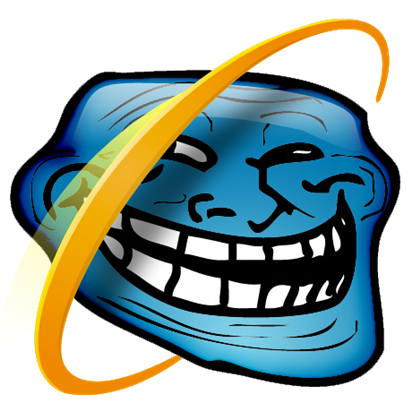 Currently using IE 6 on Windows 98. I mean, this is not a feature request but like ... can temporarily suspended user (like those suspended for 20 years) wind back the time machine and ask questions or give answers on the site before they get banned or after their suspension get lifted. Is it possible? Where is the "tn tn" sound? 90's website is incomplete with the welcome music. Kind of pedantic, but #tm-scroll could use a will-change: transform. Not the answer you're looking for? Browse other questions tagged discussion time-machine . Why is this user no longer a moderator? Why are Stack Overflow questions receiving so many views lately? Why is the new website design not using tables for alignment? How did Documentation achieve the goals that Stack Overflow could not? Should a question be put on a dedicated external forum in preference to Stack Overflow? Will time-machine design be an option in the future?